AngularJS lets you organize data, so that it only shows up something if it meets certain criteria. It does through something called AngularJS filters. Filters in angularjs transforms the data as it passes from the scope to the directive but it doesn’t change the source data, allowing you to flexibly format or transform data for display in views. We can use filters in angularjs with expressions or to modify the information from our models.Now the easiest way to understand how filters in angularjs works is to add them in expressions. You can see that guitar names are in uppercase. If you have run it in your firefox browser, you might be looking for that price and date (seen in above pic) but it wont show up yet. Lets see how you can add other filters. Also search pannel will not work for now, we shall work on it in next tutorial. But for now just focus on FILTERS only. limitTo – Select/Display a limited no. of objects/information from a model(data). Now you will see $ (dollar sign) with price. Secondly, Item.price is getting price from data.json and | currency is filtering it. You can also use it this way for different currency as well. Now you will see price will be have no tenth value. You can also use it this way for different type of values. Now you will see description is formatted in json. Now you will see ‘price revised on’ in your application. You can also use it this way for showing just the day and month. Now you will see only two guitars in your application. 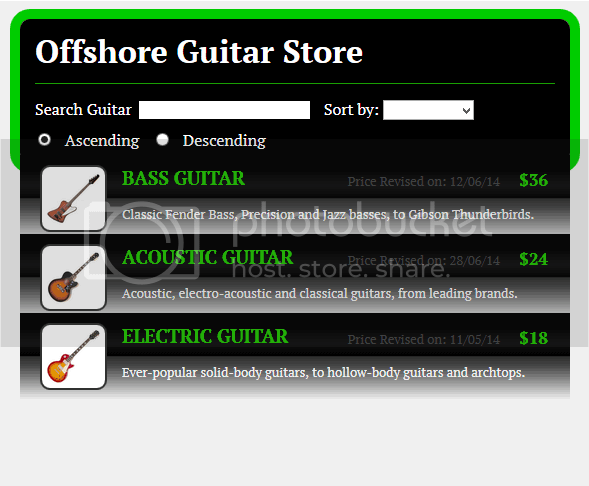 You can also use it this way for ordering guitars in descending order. 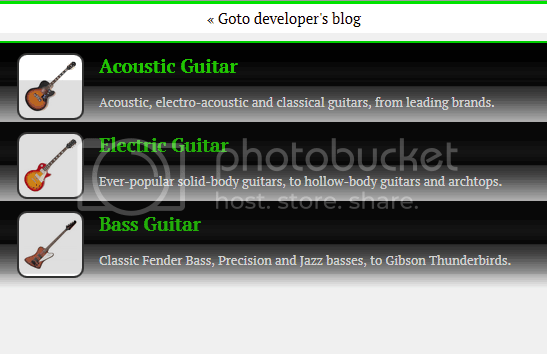 You can also use it this way for showing only EXPENSIVE guitarsin your application.